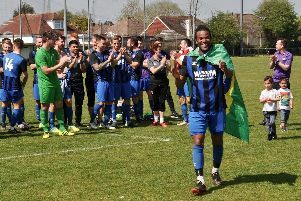 Shoreham Football Club manager Sammy Donnelly admits his team cannot give anymore then they currently are as the battle for Bostik League South survival continues. Sean Roddy’s first half spot-kick saw Mussels come from a goal down to take a 1-1 draw from their home league clash with Molesey on Saturday. Failure to take all three points proved costly as second-from-bottom Ashford United moved nine points clear of basement boys Mussels by beating Thamesmead Town. A draw on Saturday stretched Mussels’ winless run to 11 matches in all competitions but boss Donnelly insists his players are doing everything they can to turn things around. He said: “I’d say the draw against Molesey was certainly a point gained. “We played really poor in the first half but we much better after half time. We’re doing all we can at the minutes, things are just not going for us. “George (Gaskin) had a goal disallowed for offside, which if that stands, we come away with a win and it’s a different story. Shoreham were slow out of the blocks and made to pay as they were a goal down on the half-hour. Ronald Sobowale struck to fire Molesey in front, putting them in control. Mussels centre-half Odofin O’Niel went down under a challenge in the area four minutes before the break, with a spot-kick awarded, Roddy stepped up and put the penalty away as Mussels went in level at the break. Shoreham were much-improved after the break and they thought they’d won it when Gaskin struck 20 minutes from time. The forward’s effort was ruled out for offside, ensuring it ended all square. Mussels were without a midweek match this week, giving them the chance to train on Tuesday and this evening. Shoreham boss Donnelly hopes an eight-day rest between the draw with Molesey and a trip to Waltson Casuals on Saturday will benefit his squad. He added: “We’ve had a lot of midweek games this season, which hasn’t allowed us to train two times a week. “We’ve had a chance to do that this week, we’ll work on certain things in training, it also gives the squad a chance to get together. “Walton Casuals are fighting in and around the play-off places, so we know it’s going to be another tough trip. “Every game in this league is as tough as the next, we know we’ve got out work cut out each week. “Apart from what was a really poor first half performance on Saturday, we’ve been playing quite well. “It’s about turning good displays in to wins, which will hopefully see us start to climb the table. SHOREHAM: Broadbent; Roddy, O’Niel, Gathern, Whitehead; Packer, Carey, Whitmore; Herbert; Gaskin, Myers. Subs: Robinson (Herbert), Hand (Whitmore), Bullivant, Denyer, Diakiesse.